Amanda's Colour Creations: Happy Birthday Bro!! I do hope your having a great time in you crafty place. Today is a special day for me as it's my Brother's Birthday!!!! I have made him a card using a rather dashing image called Heart Moustache. They are so quirky and i have to say i love them all!! So pop along to the store Bloobel Stamps and go have a peek.... you won't be disappointed!! Isn't he such a Dashing & Dapper Chap! I had so much fun making this card for my brother, i really do love making male cards. Just hope my brother likes it now. Loving your card both in the design/layout and the fab image. What a great card for your brother, I'm sure he will love it. 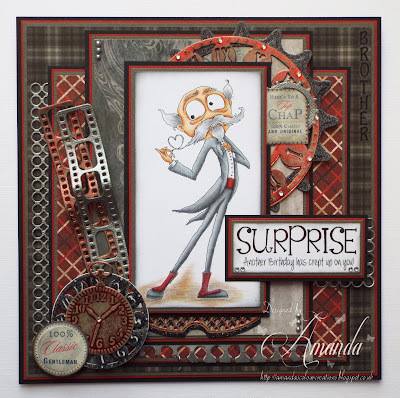 Beautifully coloured image on a beautiful steampunk-ish card, Amanda! Definitely a make that fits in with our challenges wonderfully! Thank you for playing along with us at SanDee&amelie's STeampunk Challenges! Beautiful card. Thank you for sharing it with us at Crafty Girls Creations. 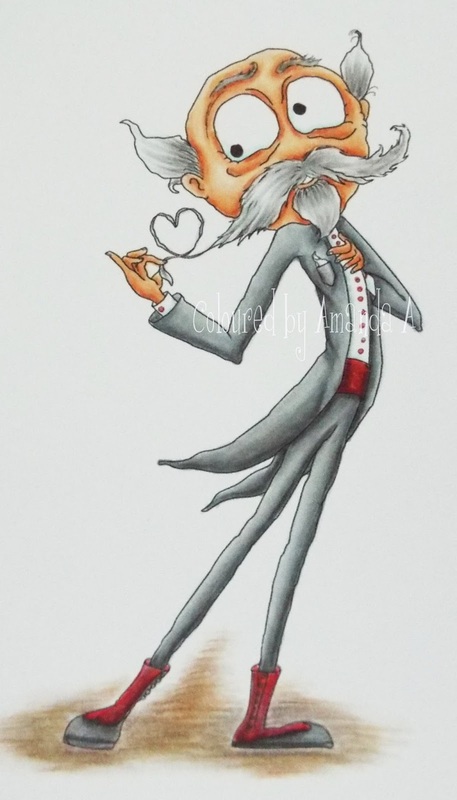 Fab card, I love your coloring, it's just amazing! Certainly, your brother will be happy with this great card. It is very well shaded and steampunk-like. Thank you for participating in SanDee&amelie's Steampunk Challenges. Gorgeous card! Such a funny image! Thank you for joining our challenge at Kraftin' Kimmie Stamps! Hope to see you again! Fabulous card! Love that great image! Wonderful coloring too! Wonderful card!!! I love what you did with him, your coloring is fantastic!! The embellishments and colors are ideal as well :) Thanks for playing along with us at Creative Fingers this time! A Heart within a Heart. It's a Cupcake Kinda Day! !